Offering you a complete choice of products which include on site flange repair service and lower crankcase metal locking repairing service. 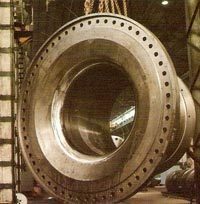 We are providing On Site Flange Repair Service to our esteemed clients. This is an effective process of repair on site especially for the components that are of heavy weight and of enormous size of large diesel engine, generators, compressor, turbine, rotating equipment etc. These services are available at leading market prices. We are offering Lower Crankcase Metal Locking Repairing Service to our highly valued customers. Metal between each drilled hole is removed by ripping it away with pneumatic tools to form a slot. The stock thus removed is narrower than the drilled hole, thus forming a serrated opening. These services are easily available at a very low market prices.